Superman and Batman have long been the top favorites in the DC Universe - and the only things fans love more than seeing them in their respective adventures is seeing them team up to take on evil. In fact, fans love the Superman/Batman pairing so much that in 2003, DC Comics launched an ongoing Superman/Batman comic book series as a reboot of the historic series World's Finest Comics, which ran from 1941 to 1986. 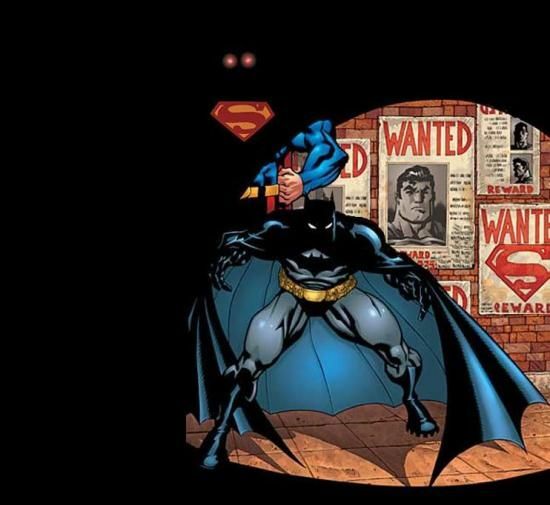 The first six issues of the new Superman/Batman featured a story called "Public Enemies", which was written by Batman scribe Jeph Loeb (The Long Halloween, Hush) and illustrated by Superman artist Ed McGuinness. The story centered on Superman and Batman taking on President Lex Luthor (you read that right) and a whole bunch of DC villains and heroes, who all believe that Superman is responsible for a Kryptonite meteor careening towards Earth. Loeb and McGuinness did such a fantastic job with "Public Enemies" that the DC Universe animation team (once again led by DC guru Bruce Timm) decided to adapt the story for their latest direct-to-DVD (and Blu-ray) animated feature film. I'll be reviewing the DVD version. Superman/Batman: Public Enemies is an almost carbon-copy translation of Loeb and McGuinness's work on the page. 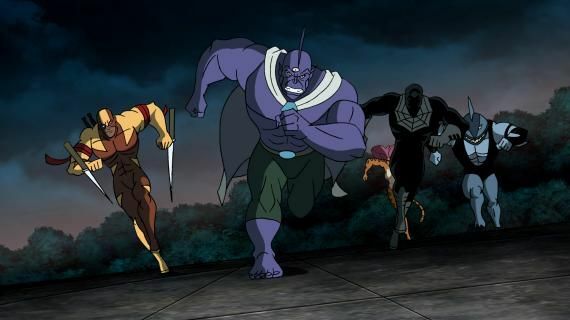 Directed by Sam Liu (Hulk vs. Thor), the animated feature is drawn in the Jack Kirby-meets-anime style that McGuinness is famous for, while the script by Stan Berkowitz smartly preserves a lot of Loeb's dialogue from the comic. I for one am happy that the filmmakers chose to glue themselves to the source material and not let go. For those who have read the comic book version of Public Enemies: If you enjoyed what you read then you'll get the same geektastic thrill I did watching the story come alive, looking oh so gorgeous on the big (TV) screen. For those who didn't read the comics: You're in for one of the best Superman/Batman stories ever written, embedded in 67 minutes of non-stop, old-school super hero action and adventure. This film is literally a start-to-finish series of battles. Superman and Bats take on everyone from Metallo, Gorilla Grodd, Mongul, Major Force and about four different ice-powered villains from around the DCU, to fellow heroes Captain Atom, Hawkman, Captain Marvel, and ultimately, Luthor himself. That's pretty much the movie. Each battle sequence is a pleasure to watch and highlights the differing styles, tactics, strengths and weaknesses of both Supes and Bat The battles also highlight the bond that makes these two heroes truly equals. As with any translation, we do lose a few things: Some plot points of the beginning and ending were changed to fit a standalone feature film, and in the middle we lose that great sequence from the comics where the sidekicks and disciples of Supes and Bats (Robin, Supergirl, Nightwing, Superboy, etc...) storm the Oval Office, only to get their butts handed to them by Luthor. The biggest loss, however, is Loeb's wonderful Supes/Bats dual internal monologue technique, which he employed brilliantly in "Public Enemies" to illustrate the heroes' comparative/contrasting opinions of one another. It was a highly enjoyable aspect of the comic, but I'm sure we can all understand why it didn't make it into the movie. Just one more reason to pickup the comic version and read it for yourself. Speaking of the comic, for fans who might be wondering: Yes, we still get to see the Superman/Batman rocket ship - and yes, Power Girl is still drawn with all her fantastic endowments in place :-) . 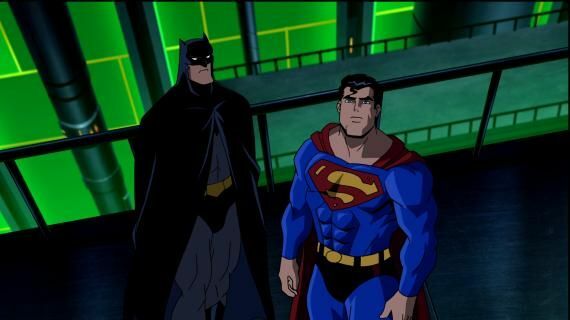 Stars of the former Superman and Batman animated TV series - Tim Daly, Kevin Conroy and Clancy Brown - all return in Public Enemies to voice Supes, Bats and Luthor, respectively. CCH Pounder (The Shield) also returns to voice Luthor's Government Black ops cohort, Amanda Waller. Hearing the iconic voices of animated Superman and Batman is always a welcome treat, and the actors haven't lost a step with their characters (Brown especially - he has a good ol' time with Luthor).